In 2007, the Center for Automation in Nanobiotech (CAN) outlined the hardware and software platform that would one day allow robots smaller than human cells to make medical diagnoses, conduct repairs, and even self-propagate. In the same year, the CBS network re-aired a program about the effects of propranolol on sufferers of extreme trauma. A simple pill, it had been discovered, could wipe out the memory of any traumatic event. At almost the same moment in humanity's broad history, mankind had discovered the means for bringing about its utter downfall - and the ability to forget it ever happened. Shift is a prequel to Wool and begins several centuries prior to the events in Wool. Shift is the story of how the silo that you first met in Wool came to be. Shift focuses on new characters and a few characters that you only briefly met in Wool. For those who do not know, Wool, Shift, and the final book Dust are all Amazon serials. After each book was finished, Hugh Howey collected each series into a book. In other words, there is a Wool #1, Wool #2, etc. You can buy each section for about $0.99 or you can buy the complete novel for a few dollars. This is a unique purchasing format, because you have the opportunity to read each section as it comes out or just wait until the entire book is done. It is kind of like choosing to read a monthly comic or waiting for the trade paperback to come out. I read Wool last year, and I greatly enjoyed it. It was a fascinating post-apocalypse SF-ish story. I was quite intrigued to learn how these people ended up living in an underground silo, why the world was destroyed, and why there were so many secrets surrounding the world's apocalypse. 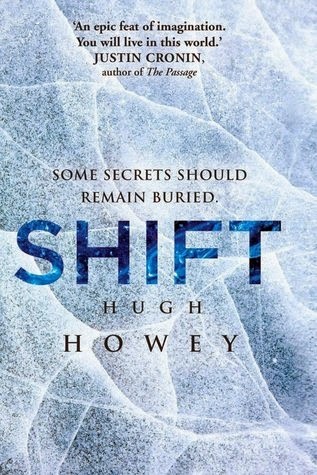 Although Shift does not answer all of these questions exactly (there is a third and final book in this trilogy), Shift answers enough of my questions to satisfy me until I have a chance to read Dust. If you loved Wool and want to know what happens next in the story, Shift is going to disappoint you. This book focuses on how everything came about. Personally, this is my favorite thing about post-apocalypse stories, the how things went horribly wrong. Howey does a good job of showing how a group of fairly ordinary people went about making really bad decisions. Like in Wool, Howey switches between a few different POVs. I felt like the POV switching wasn't as seamless as in Wool; however, this may have been due to listening to the audio book (i.e., the switch between POV characters wasn't always clear). Some of the POV switching also entailed jumping to a different place in time, and I felt this was a bit confusing at times. I understand why Howey did it; however, I am just not a fan of this much time jumping. Unlike GRR Martin though, Howey only has a few POV characters, so once you know who is "speaking," you have a very clear idea of what is happening. Similar to Wool, the characters were interesting, and I quickly found myself relating to them. Shadow and Shadow's relationship with a particular character was heart breaking. At the same time, I wish there had been a female POV chapter. There were several female characters in the book, but I would have like to have had one female POV chapter. The gender balance was fine, but a female POV chapter would have been nice, because the men all seemed to have a wee bit more agency. I wish I had read Shift closer to completing Wool, because there were times that I was not sure if Howey was writing something purposefully vague or I should have known what Howey was talking about because you need to read Wool first. There were times where Howey was being vague to surprise you and there were times that I didn't catch on quickly, because I didn't remember an event from Wool. In retrospect, I should have read a recap of Wool before beginning Shift. Audio: Reynolds did a good job with tone, inflection, and clarity. There was no background noise. Reynolds did an okay job doing different voices. My biggest complaint about this audio book was that the only warning that we were switching POVs was a mention of the date. As someone listening to the audio book while driving to work, this was not enough of an anchor for me. There were several instances in which I did not realize that we had switched POVs, especially early on in the book. A little more warning prior to a shift (no pun intended) or multiple readers would have helped the audio book be a bit more fluid. With that said, the audio book was still enjoyable. Overall, I really enjoyed this book. I was fascinated by learning about the history of the events that led up to the events in Wool. I look forward to sitting down with Dust and learning how this whole series comes together in the end.